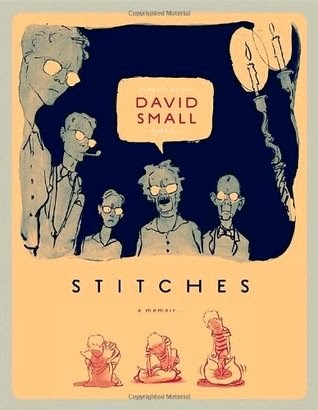 Stitches is the memoir of David Small told in graphic novel format. Small is an award-winning children's author, but his own childhood is far from a happy and successful one. He was born into what many would consider a privileged home, his father being a successful doctor. However, Small's life was filled with many disturbing details. At the top of this list was that he was never told that he had cancer; the kind of cancer that stole his voice. I began this book with no expectations. I knew very little about Small's story. When I turned the last page, I was left with very mixed emotions: disgust at his parents, awe at his resilience, and so much more that I am not sure how to even put into words. I am not even going to try to put it into words because Small's art will simply show you. As a young boy, Small had his voice taken away, but through Stitches he has shared his story loud and clear through his art and his words. He shows us that bad things can and do happen, but also that there is hope even in the most unlikely situations. Stitches is not an easy read, particularly emotionally, but it is one that will stick with you for a very long time. Have you experienced Small's memoir? What did you take away from it? I could have sworn I read this, but I couldn't remember anything about it, and when I checked my blog archives, I couldn't find a review of it. Weird! I've been not getting it every time I've been at the library because I had it in my head that I'd already read it. But apparently not! This sounds stunning. I wasn't aware of this memoir before I read your review, and now I can't wait to get my hands on it. Sounds like it illicited the same reaction from you that I had to Jeanette Walls' memoir, The Glass Castle. Different content, but a similar dazed feeling at the end. Andi ... Dazed is a really good way to describe my feelings. (I also felt something similar with The Glass Castle!) If you read it, let me know. I would love to hear what you think!